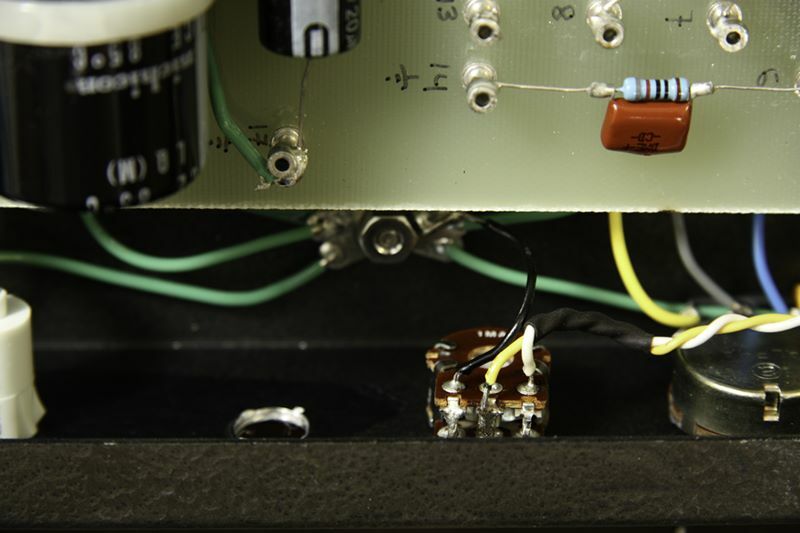 This article shows how I added a power-scaling circuit to a tube guitar amplifier.Power-scaling is the art of adding circuitry to a tube guitar amplifier in orderto get the glorious overdriven tube distortion at lower volume levels.The power-scale circuit does this by lowering the screen voltages of the output tubes.Thus the guitar signal and the preamp signal is not affected.Just the output tubes are fooled into thinking they are overdriven and distorted.The tone and the content of the output signal is hard to duplicate by other means.It sounds sweet!If you want to skip the build description and just hear the amplifier,jump to the sound clips. 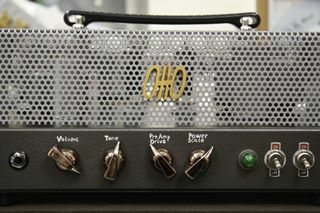 The basis of this power-scaled amp is a build-it-yourself kit guitar ampdesigned by Gerhart Amplification and sold by Guytronix.This design is a 12AX7WA preamp tube driving two EL84 power tubes in a push-pull configuration.The makers call this design the Ardmore, but affectionately I call my instance the Otto,and I have a detailed article of its building.The photo at right shows how I painted, enclosed, and gave a mock badge to the basic kit . My messy hobby desk is about as clean as it's going to get. 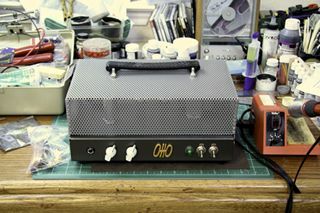 The London Power SB-84 Super Budget Power Scale kit is on the left.The trusty soldering iron on the right.Some music is on the playerLet's build this project! This photo shows the Otto amplifier with the protective hood off.You can see the top of the project box is a bit dusty.The Mercury Magnetics power supply is at the back left.The Mercury Magnetics power transformer is at the back right.The 12AX7 preamp tube is in the protective metal can at the front left.The 2 EL84 power tubes are at the back.Volume and tone controls in front along with standby and power switches.The "Otto" logo is modelled from Sculpey clay and painted with brass paint. This photo shows the bottom of the project box removed.Inside you see the amplifier circuitry as I built it back in April of 2010.The circuit board is a composite material with metal turret pegs.Most electrical components are soldered to these metal turrets. The large black cylinder is the "death capacitor" which isso named because it is huge and stores 400 V of energy ready tokill you if you touch it or other inappropriate, juiced parts of the circuit.The reason this cap is so large is that it has the task of smoothingout the AC voltage and helping to convert it to a nice level DC voltage.The red lead of the death cap leads to the DC supply posts.You can see about 5 different components connect to this spot in orderto get some power. 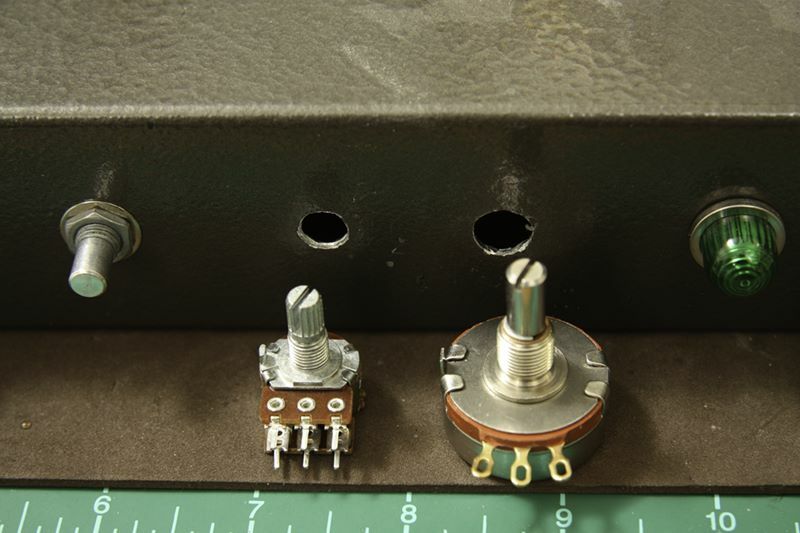 I've shorted out the death cap intentionally once, and the spark was strong enough to weld metal.If you work on tube amps, be sure you have a 5W 500 ohm resistor that you can useto drain the death cap and other parts of the circuit. The other wires around the board are there to hook up the tube sockets, the supply transformers,and the front panel controls to the circuit. 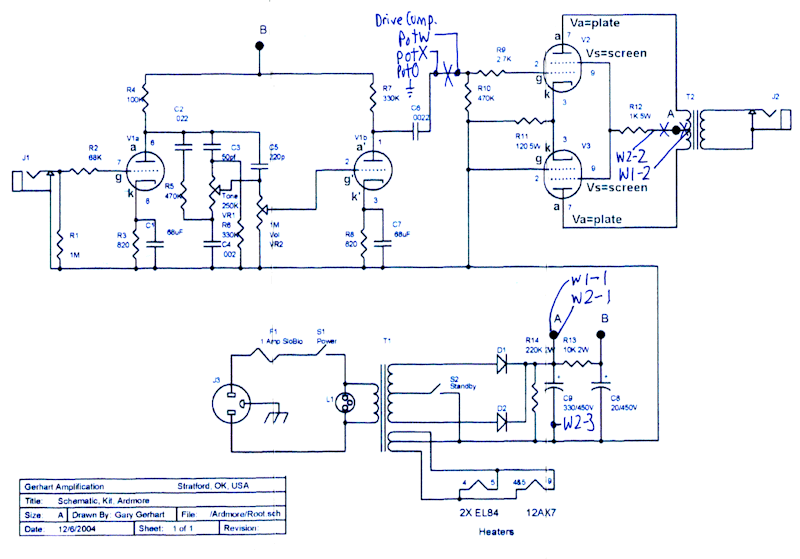 This circuit diagram shows how we will attach the London Power SB-84 Power-Scale kit to the guitar amplifier.The modifications are in my handwriting in blue. 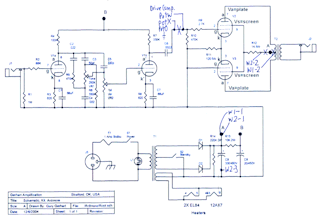 The top left of this diagram shows the preamplifier circuitry that is connected to the guitar jack at left.The top right of this diagram shows the power amplifier circuitry connecting to theoutput transformer and the speaker jack at right.The bottom of the diagram shows the power supply circuitry and howthe AC power from the wall socket goes through the power supply transformerand gets rectified by two diodes and the power smoothing capacitors. 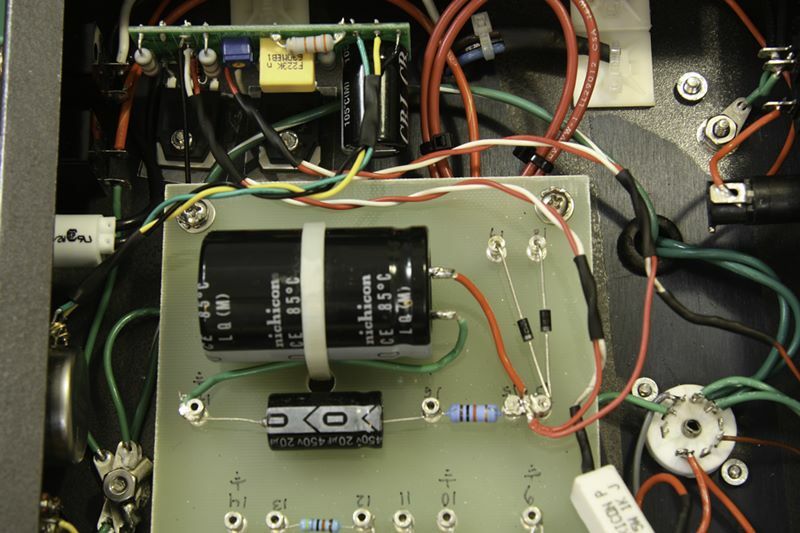 At the top center is the attachment of the "Drive Compensation" potentiometer.This pot helps scale the preamp output to a lower level.In power-scaling, as the power supply level to the output tubes drops, sometimesthe preamp signal can get too large for the output tube gates.To control the amount of distortion in the output tubes this pot lets you leave the preamp signalat full blast (thus distorting the output tubes) or drop it proportionately.The drive compensation pot passively interrupts the preamp signal.The pot is independent from the rest of the power-scale circuit and couldbe added to any guitar amp project on its own. The rest of the power-scale circuit attaches between the output tubes andthe output transformer.As I've mentioned, the power-scale circuit works by lowering the screen voltage to the output tubes.Thus, the input signal at the tube gate gets overdrives the screen voltage and goesinto the distortion zone.One loose end, the chunky 5 watt ceramic resistor R12,goes into the W2-2 pad of the power-scale circuit and then the W2-1 padattaches to the main DC supply rail.Then, W1-1 returns from the DC supply rail and attaches through W1-2 of the center tapof the output rail.Inserting the power-scaling circuitry here allows it to control the output tube screens and platevoltages, starving it off, and putting it into the overloaded distortion zone. 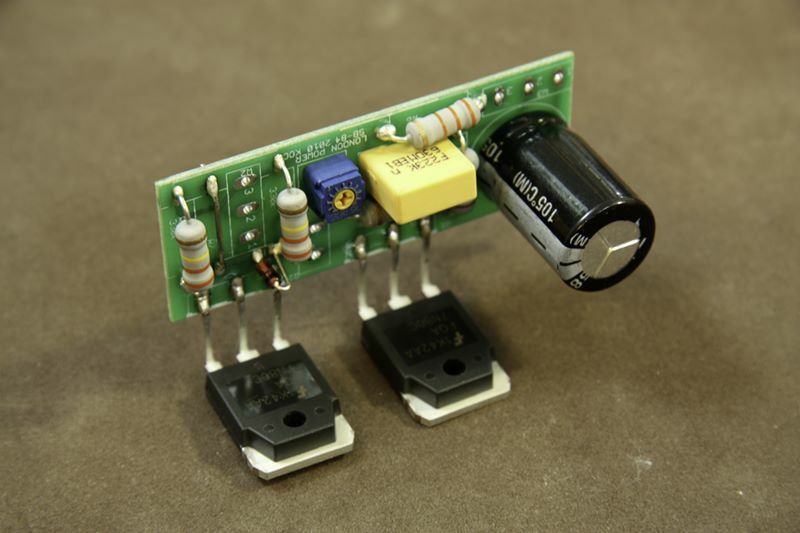 Another beefy potentiometer controls the amount of power scaling.I won't get into how the power-scale circuit does this, but suffice to say, the pot controls two large powerful JFET transistorsto control the power level. 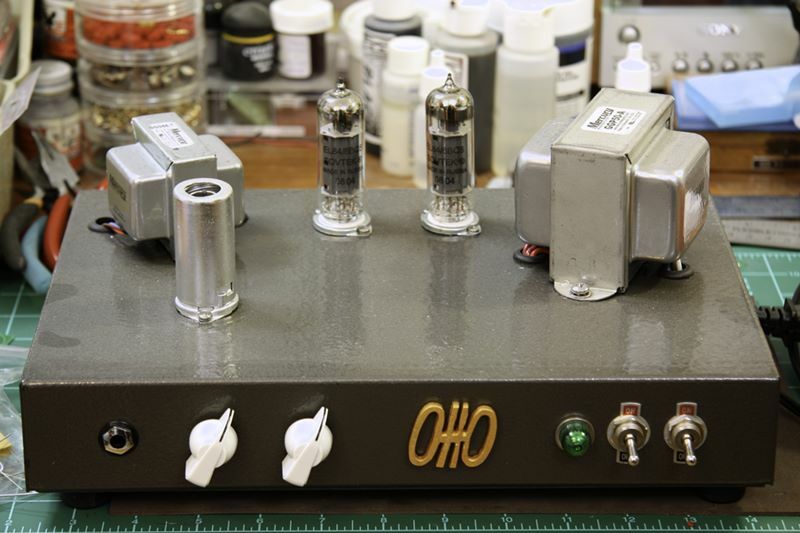 Here is the first mod for attaching the power-scale circuit.I removed the old Otto logo and drilled two holesfor the power-scale pots.The smaller pot on the left controls the pre-amp outputdrive.The larger pot on the left controls the overall levelof power scaling. I paid close attention to removing metal filings from the drillinginto the amplifier case.Metal filings are the killers of guitar amplifiers.One filing can easily short out a 400 volt signal.I went through close to an entire can if aerosol dusting spraytrying to get every filing out of the project box. This photo shows the drive compensation pot attached to the front control panel.The black lead connects the pot to the star ground point under the board.The white and yellow leads go to the preamp output signal.One lead contains the full level preamp signal.The other lead is diminished by the resistor in the potand returns to the the gate of the power tubes. I don't know why my solder joints look so sucky these days.Ideally, solder joints should be shiny and flowing over wiresand pads, forming nice pools of solid connection withoutburning the components or the circuit boards.Perhaps because modern solder wires no longer have lead, they areless shiny than I am accustomed to.Perhaps my soldering iron is not hot enough.Yeech. I try my best, but many joints in this article look terrible. Here is the other side of the drive compensation pot connections.From the circuit diagram, you can see the insertion point of thepot is between C6 and R10.It is an easy process to disconnect C6 and put the pot leads in there. This connection proved to be my one mistake in the circuit hook-up.By hooking up the pot this way, the full preamp signal is sent when the pot is turned hard left.The diminished signal is sent when the pot is turned hard right.I prefer the opposite convention, so later on I reversed the yellowand white leads shown here - an easy 5 minute fix. The wire color choices are arbitrary.I tended to use green or black for grounds, red for hot DC signals,and yellow or white for signals.I ran out of colors so this formula is not strictly followed. Heat shrink tubing is used over splices to prevent short circuitswith other metal objects.The heat shrink tubing is also useful to group and hold wires together,for instance where you want a twisted pair to stay put. This photo shows the assembledLondon PowerSB-84 Super Budget Power Scale kit.The black capacitor at the right helps regulate power.The two large black "feet" at the bottom are JFET power transistors that control the DC power supply rail.The two JFETs dissipate much heat so they are mounted to the caseto help transfer the heat to a larger metal body. 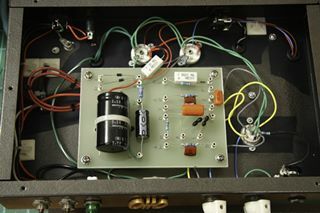 The remaining open connections are attach points for wiring in this circuit to your amplifier.W3 at the upper right attaches to the power-scale pot in the front control panel.W2 at the left attaches to the power tube outputs.W2 under the blue trim put attaches to the power transformer inputs.More wires will drop in here later in the article. You might notice the straight wire connection to the upper left, replacing resistor R7.When Kevin O'Connor of London Power reviewed my designon the Power Scaling forums, he graciously checked for errors and told me that since my amp has an output resistor, I can omit this resistor.It's nice to have experts review your work. Once again, sorry for the lame solder joints.It's a skill that I need to improve. 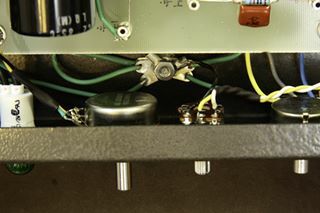 This photo shows the large power scale pot mounted to the amplifier control panel.The three outputs of the pot go back to the W3 pads of the power-scale circuit boardto control the level of the output tube power supply.The wires are twisted and wrapped with shrink tubing to keep them neat. In the background you can see the star ground of the circuit getting mighty crowded.The star ground is the single attachment point to which all ground points are attached.If the entire circuit is grounded at one place, there is no chance forvoltage differences to introduce noise to the circuit. 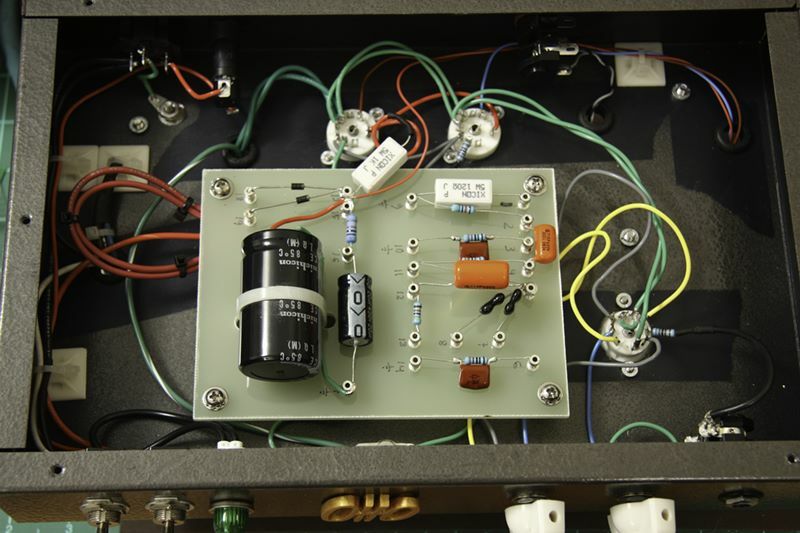 This photo shows the power scaling circuit (at top left) mounted and completely wired to the guitar amplifier.The two large JFET transistors are bolted to the black project box.Two thin slivers of mica form an electrical barrier between the transistors and the box.The large power scale potentiometer is at the far left.It is joined via braided black, green, and yellow wires to the W3 pad at the top right of thepower scale circuit board. A twisted red and white pair of wires emerges from the W2 pad of the power scale circuit board.The white wire goes to the chunky 5 watt ceramic resistor R12 at the bottom right of the photo.The red wire attaches to the DC supply rail which is the double post slightly right of center.This connection interrupts the output power tube screens. 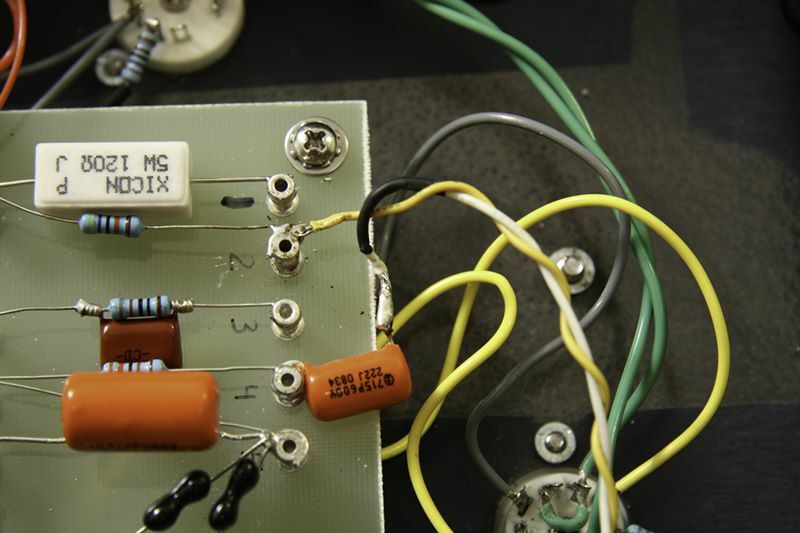 Another twisted read and white pair of wires emerges from the W1 pad of the power scale circuit board.The red wire also attaches to the DC supply rail.The white wire connects to the center tap of the output transformer which is the wireleading off the far right of the board. This photo shows the first booting up of the modified amplifier.Other than the green power light at the bottom right, it is hard to tellthat it is running.Notice the two new power-scale knobs at the amplifier control panel.Also notice the two small screw heads at the right indicating the mountingpoint for the power-scale circuit board. 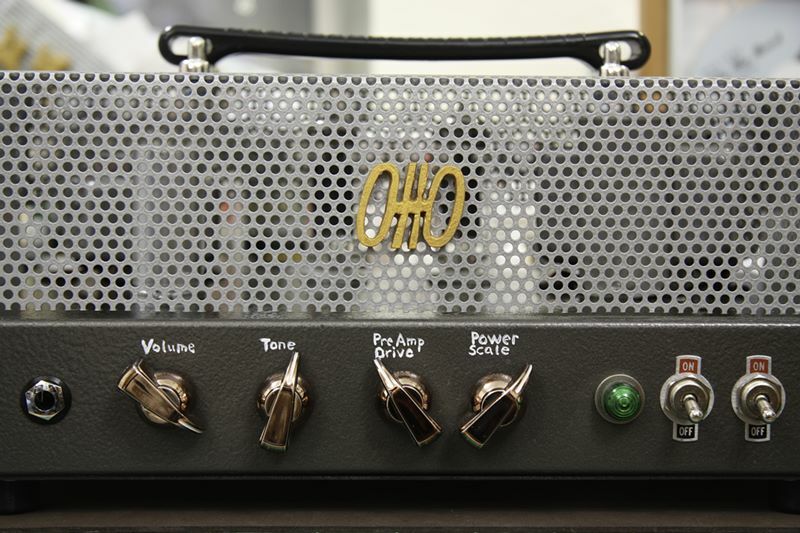 As if by magic, the amplifier started just perfectly.No sparks, no smoke, no short circuits.There also was no loud hum, no clickety clack-noise, just pure silence.I hooked up the guitar, brought up the volume and started playing with no problems. Notice the light bulb glowing in the cluttered background at the top center of the picture.This is the current limitercircuit that I built inexpensively and describe in another article.Basically, this doo-dad puts a light bulb in series with the power supply to the amplifier.The light bulb acts as a resistor which will glow brightly if your amplifier is completely shorted out. It saves you fuses and trips to the circuit breakers, but it also gives youa glimpse at the power consumption of your guitar amplifier.For instance, when you first switch on the power supply, the bulb goes verybright, and then dies off to a dull glow as the capacitors charge up.Then, when you switch on the output transformers, the bulb also goes verybright, and quiesces to the running current of your idle amplifier.Finally, the brightness of the bulb tracks the volume of your guitar playing.A very small volume has little light. Loud playing lights the bulb brightly.I'm surprised more consumer electronics don't have some sort of power consumption indicator. 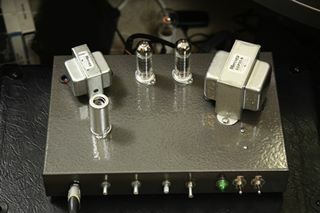 This view shows the guitar amplifier with the top in place.I've also attached some temporary knobs to the front.I did not have a complete set of black or white knobs. 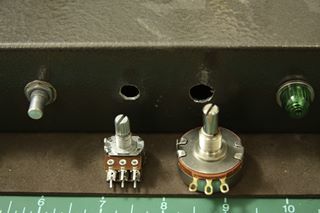 Eagle-eyed readers might notice the spacing of the rightmost black knobis slightly different.The other knobs are spaced 1.5 inches apart.If I had placed the rightmost knob also 1.5 inches apart, it would havebeen closer to the on/off light than the other knobs.So I cut down the spacing to try to group it closer with the other knobs.Unfortunately I might have mis-measured because now it lookstoo close to the other knobs, too far from the light. 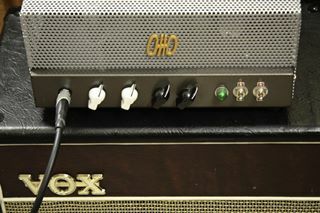 Vox aficionados might wonder what kind of speaker cabinet is shown.Well, it's not a Vox. It's an Epiphone cabinetwith new vinyl and a scavenged logo.The speaker in the cabinet is a 12 inch Eminence Red Coat Governor. 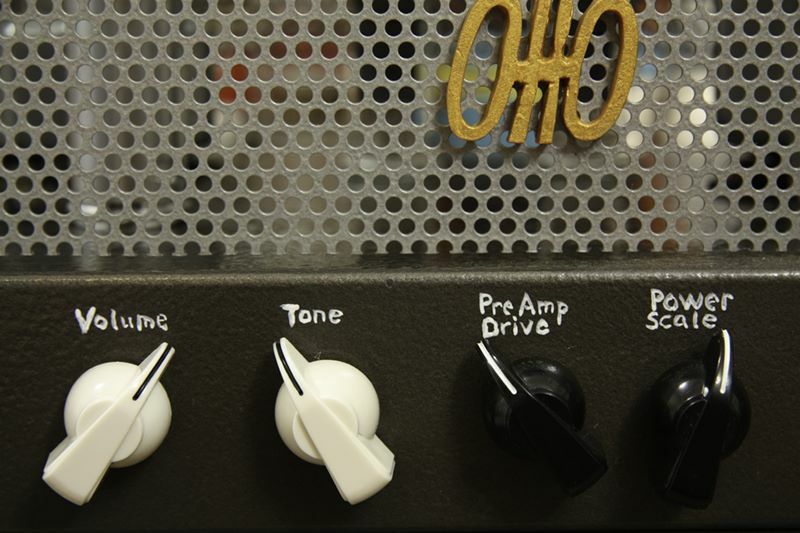 All these knobs are beginning to confuse me.So I have added some lettering to describe the knobs.From left to right are the stock volume and tone knobs.Then you have the new drive compensation and power-scale control knobs. I ordered a few sets of knobs from Antique Electonic Supply.I decided I like the bronze (metallic brown) knobs the best. That concludes the construction portion of this article.Of course the main measure of any modification is the type and the qualityof the sound it produces.I can say that the amplifier performs perfectly.The unadulterated amplifier always had a very quiet noisefloor, most likely due to the quality components included in the kit.It also has very nice clean tones and is surprisingly loud for just 8 watts.The highs are very "chimey", very Voxy likely due to the similarityof this design to Vox guitar amplifier designs.These bright clean tones remain when you dial out the power-scale circuit. 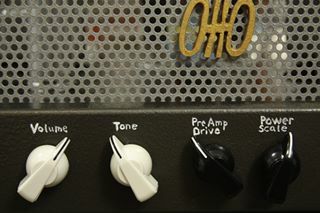 The new modifications bring a whole range of sounds to the amplifier.It is very easy to get overdriven sounds and some dark heavy metal type crunch.The power-scale control allows you to determine how this overdrive is going to happen,whether it goes overdriven continually with every note, or whether you fall off some cleanpicking and light chords into the dark heavy distorted abyss when you vary your attack. I hope to demonstrate the sound range in the next section.At this point I can say I am very happy with the London Power SB-84 Power-Scale kitmodification. 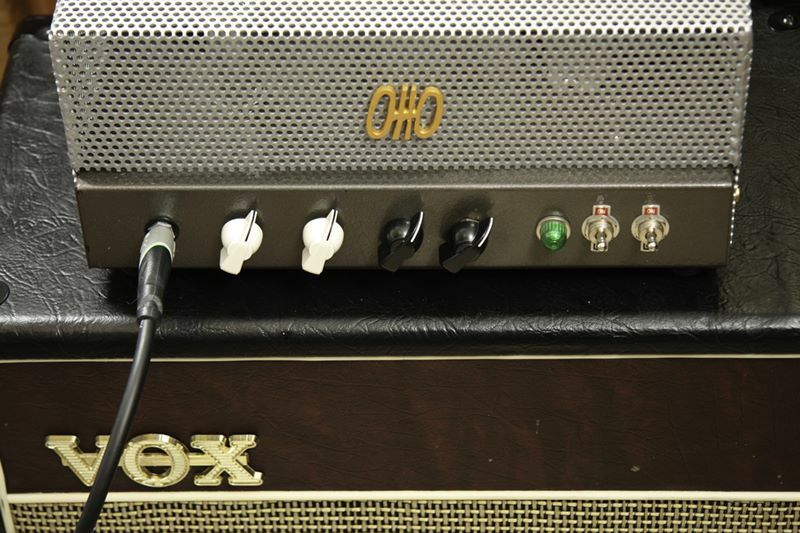 All clips recorded via the Otto 8 watt amp, Vox Virage guitar, closed-back 12" Eminence Red Coat"The Governor" cabinet, Shure SM-57 beta mic, and Zoom R16 preamps, DAC, and recording interface.No processing is applied to the recording except to normalize the volume level. E Major neck clean - this is an E majorscale and chord played on the neck pickup, clean, with low drive and low volume. G Minor bridge clean - this is a G Minorscale and chord played on the bridge pickup, clean, with low drive and low volume. Rehab clean - this is a portion ofAmy Winehouse's Rehab played cleanly with low drive and low volume. Here Comes A Regular driven - this is a portion ofthe Replacement's Here Comes a Regular played with some drive at higher volume. Peggy Sue cranked - this is a portion ofthe Buddy Holly's Peggy Sue cranked at middle volume. Last modified: Thursday, 09-Jun-2011 12:45:50 MST.